The Iliad ( , Iliás) is an epic poem in dactylic hexameters, traditionally attributed to Homer. Set in the Trojan War, the ten-year siege of Ilium by a coalition of Greek states, it tells of the battles and events during the weeks of a quarrel between King Agamemnon and the warrior Achilles. Although the story covers only a few weeks in the final year of the war, the Iliad mentions or alludes to many of the Greek legends about the siege. Along with the Odyssey, also attributed to Homer, the Iliad is among the oldest extant works of Western literature, and its written version is usually dated to around the eighth century BC . The Iliad contains approximately 15,700 lines, and is written in a literary amalgam of several Greek dialects. The authorship of the poem is disputed. (1) After the invocation to the Muses, the story begins in media res towards the end of the Trojan war between the Trojans and the besieging Greeks. Chryses, a Trojan priest of Apollo, offers the Greeks wealth for the return of his daughter Chryseis, a captive of Agamemnon, Greek leader. Although most of the Greek army is in favour, Agamemnon refuses. Chryses prays for Apollo's help, and Apollo causes a plague throughout the Greek army. After nine days of plague, Achilles, the leader of the Myrmidon contingent, calls an assembly to solve the plague problem. Under pressure, Agamemnon agrees to return Chryseis to her father, but also decides to take Achilles's captive, Briseis, as compensation. Angered, Achilles declares that he and his men will no longer fight for Agamemnon, but will go home. Odysseus takes a ship and brings Chryseis to her father, whereupon Apollo ends the plague. In the meantime, Agamemnon's messengers take Briseis away, and Achilles asks his mother, Thetis, to ask Zeus that the Greeks be fought to breaking point by the Trojans, so Agamemnon will realise how much the Greeks need him. Thetis does so, Zeus agrees, (2) and sends a dream to Agamemnon, urging him to attack the city. Agamemnon heeds the dream but decides to first test the morale of the Greek army by telling them to go home. The plan backfires, and only the intervention of Odysseus, inspired by Athena, stops the rout. Odysseus confronts and beats Thersites, a common soldier who voices discontent at fighting Agamemnon's war. After a meal, the Greeks deploy in companies upon the Trojan plain. The poet takes the opportunity to describe each Greek contingent. When news of the Greek deployment reaches king Priam, the Trojans too sortie upon the plain. In a similar list to that for the Greeks, the poet describes the Trojans and their allies. (3) The armies approach each other on the plain, but before they met, Paris offers to end the war by fighting duel with Menelaus. While Helen tells Priam about the Greek commanders from the walls of Troy, both sides swear a truce and promise to abide by the outcome of the duel. Paris is beaten, but Aphrodite rescues him and leads him to bed with Helen before Menelaus could kill. (4) Pressured by Hera's hatred of Troy, Zeus arranges for the Trojan Pandaros to break the truce by wounding Menelaus with an arrow. Agamemnon rouses the Greeks, and battle is joined. (5) In the fighting, Diomedes kills many Trojans and defeats Aeneas, whom again Aphrodite rescues, but Diomedes attacks and wounds the goddess. Apollo faces Diomedes, and warns him against warring with gods. Many heroes and commanders join in, including Hector, and the gods supporting each side try to influence the battle. Emboldened by Athena, Diomedes wounds Ares and puts him out of action. (6) Hector rallies the Trojans and stops a rout; Diomedes and Glaukos, Greek and Trojan, find common ground and exchange unequal gifts. Hector enters the city, urges prayers and sacrifices, incites Paris to battle, bids his wife Andromache and son Astyanax farewell on the city walls, and rejoins the battle. (7) Hector duels with Ajax, but nightfall interrupts the fight and both sides retire. The Greeks agree to burn their dead and build a wall to protect their ships and camp, while the Trojans quarrel about returning Helen. Paris offers to return the treasure he took, and give further wealth as compensation, but without returning Helen, and the offer is refused. A day's truce is agreed for burning the dead, during which the Greeks also build their wall and trench. (8) The next morning, Zeus forbids the gods from interfering, and fighting begins anew. The Trojans prevail and force the Greeks back to their wall while Hera and Athena are forbidden from helping. Night falls before the Trojans can assault the Greek wall. They camp in the field to assault at first light, and their watchfires light the plain like stars. (9) Meanwhile, the Greeks are desperate. Agamemnon admits his error, and sends an embassy composed of Odysseus, Ajax, Phoenix, and two heralds to offer Briseis and extensive gifts to Achilles, who has been camped next to his ships throughout, if only he would return to the fighting. Achilles and his companion Patroclus receive the embassy well, but Achilles angrily refuses Agamemnon's offer, and declares that he would only return to battle if the Trojans reach his ships and threaten them with fire. The embassy returns empty-handed. (10) Later that night, Odysseus and Diomedes venture out to the Trojan lines, kill the Trojan Dolon, and wreak havoc in the camps of some Thracian allies of Troy. (11) In the morning, the fighting is fierce and Agamemnon, Diomedes, and Odysseus are all wounded. Achilles sends Patroclus from his camp to enquire about the Greek casualties, and while there Patroclus is moved to pity by a speech of Nestor. (12) The Trojans assault the Greek wall on foot. Hector, ignoring an omen, leads the terrible fighting. The Greeks are overwhelmed in rout, the wall's gate is broken, and Hector charges in. (13) Many fall on both sides. The Trojan seer Polydamas urges Hector to fall back and warns him of Achilles, but is ignored. (14) Hera seduces Zeus and lures him to sleep, allowing Poseidon to help the Greeks, and the Trojans are driven back onto the plain. (15) Zeus awakes and is enraged by Poseidon's intervention. Against the mounting discontent of the Greek-supporting gods, Zeus sends Apollo to aid the Trojans, who once again breach the wall, and the battle reaches the ships. (16) Patroclus could stand to watch no longer, and begs Achilles to be allowed to defend the ships. Achilles relents, and lends Patroclus his armour, but sends him off with a stern admonition to not pursue the Trojans, lest he take Achilles's glory. Patroclus leads the Myrmidons to battle and arrives as the Trojans set fire to the first ships. The Trojans are routed by the sudden onslaught. Patroclus, ignoring Achilles's command, pursues and reaches the gates of Troy, where Apollo himself stops him. Patroclus is set upon by Apollo and Euphorbos, and is finally killed by Hector. (17) Hector takes Achilles's armour from the fallen Patroclus, but fighting develops around Patroclus's body. (18) Achilles is mad with grief when he hears of Patroclus's death, and vows to take vengeance on Hector; his mother Thetis grieves, too, knowing that Achilles is fated to die if he kills Hector. Achilles is urged to help retrieve Patroclus's body, but has no armour. Made brilliant by Athena, Achilles stands next to the Greek wall and roars in rage. The Trojans are dismayed by his appearance and the Greeks manage to bear Patroclus's body away. Again Polydams urges Hector to withdraw into the city, again Hector refuses, and the Trojans camp in the plain at nightfall. Patroclus is mourned, and meanwhile, by Thetis's request, Hephaistos fashions a new set of armour for Achilles, among which is an magnificently wrought shield. (19) In the morning, Agamemnon gives Achilles all the promised gifts, including Briseis, but he is indifferent to them. Achilles fasts while the Greeks take their meal, and straps on his new armour, and heaves his great spear. His horse Xanthos prophesies to Achilles his death. Achilles drives his chariot into battle. (20) Zeus lifts the ban on the gods' interference, and the gods freely intervene on both sides. Burning with rage and grief, Achilles's onslaught is terrible, and slays many. (21) Driving the Trojans before him, Achilles cuts off half in the river Skamandros and proceeds to slaughter them and fills the river with the dead. The river, angry at the killing, confronts Achilles, but is beaten back by Hephaistos's firestorm. The gods fight among themselves. The great gates of the city are opened to receive the fleeing Trojans, and Apollo leads Achilles away from the city by pretending to be a Trojan. (22) When Apollo reveals himself to Achilles, the Trojans have retreated into the city, all except for Hector, who, having twice ignored the counsels of Polydamas, feels the shame of rout and resolves to face Achilles, in spite of the pleas of Priam and Hecuba, his parents. When Achilles approaches, Hector's will fails him, and he is chased around the city by Achilles. Finally, Athena tricks him to stop running, and he is caught and killed by Achilles. Achilles takes Hector's body and dishonours it. (23) The ghost of Patroclus comes to Achilles in a dream and urges the burial of his body. The Greeks hold a day of funeral games, and Achilles gives out the prizes. (24) Dismayed by Achilles's continued abuse of Hector's body, Zeus decides that it must be returned to Priam. Led by Hermes, Priam takes a wagon out of Troy, across the plains, and enters the Greek camp unnoticed. He grasps Achilles by the knees and begs to have his son's body. Achilles is moved to tears, and the two lament their losses in the war. After a meal, Priam carries Hector's body back into Troy. Hector is buried, and the city mourns. The many characters of the Iliad are catalogued; the latter-half of Book II, the “Catalogue of Ships”, lists commanders and cohorts; battle scenes feature quickly-slain minor characters. The Achaeans ( ) — aka the Hellenes (Greeks), Danaans (Δαναοί), and Argives (Ἀργεĩοι). Agamemnon — King of Mycenae ; leader of the Greeks. Achilles — Leader of the Myrmidons. Odysseus — King of Ithaca ; the wiliest Greek commander, and hero of the Odyssey. Aias — son of Telamon, with Diomedes, he is second to Achilles in martial prowess. Menelaus — King of Sparta ; husband of Helen and brother of Agamemnon. Diomedes — son of Tydeus, King of Argos . Aias (Ajax the Lesser) — son of Oileus, often partner of Ajax the Greater. Hector — son of King Priam; the foremost Trojan warrior. Aeneas — son of Anchises and Aphrodite. Deiphobus — brother of Hector and Paris. Priam — the aged King of Troy. Polydamas — a prudent commander whose advice is ignored; he is Hector’s foil. Agenor — a Trojan warrior who attempts to fight Achilles (Book XXI). Dolon ( ) — a spy upon the Greek camp (Book X). Antenor — King Priam’s advisor, who argues for returning Helen to end the war; Paris refuses. Polydorus — son of Priam and Laothoe. Hecuba ( ) — Priam’s wife; mother of Hector, Cassandra, Paris, and others. Helen ( ) — Menelaus’s wife; espoused first to Paris, then to Deiphobus. Cassandra ( ) — Priam’s daughter; courted by Apollo, who bestows the gift of prophecy to her; upon her rejection, he curses her, and her warnings of Trojan doom go unheeded. Nostos (νόστος — homecoming) occurs seven times in the poem (II.155, II.251, IX.413, IX.434, IX.622, X.509, XVI.82); thematically, the concept of homecoming is much explored in Ancient Greek literature, especially in the post-war homeward fortunes experienced by Atreidae, Agamemnon, and Odysseus (see the Odyssey), thus, nostos is impossible without sacking Troy — King Agamemnon’s motive for winning, at any cost. Kleos (κλέος — glory, fame) is the concept of glory earned in heroic battle; for most of the Greek invaders of Troy, notably Odysseus, kleos is earned in a victorious nostos (homecoming), yet not for Achilles, he must choose one reward, either nostos or kleos. In Book IX (IX.410–16), he poignantly tells Agamemnon’s envoys — Odysseus, Phoenix, Ajax — begging his reinstatement to battle about having to choose between two fates (διχθαδίας κήρας — 9.411). In foregoing his nostos, he will earn the greater reward of kleos aphthiton (κλέος ἄφθιτον — fame imperishable). In the poem, aphthiton (ἄφθιτον — imperishable) occurs five times (II.46, V.724, XIII.22, XIV.238, XVIII.370), each occurrence denotes an object (i.e. Agamemnon’s sceptre, the wheel of Hebe’s chariot, the house of Poseidon, the throne of Zeus, the house of Hephaistos); translator Lattimore renders kleos aphthiton as forever immortal and as forever imperishable — connoting Achilles’s mortality by underscoring his greater reward in returning to battle Troy. Akin to kleos is timê (тιμή — respect, honour), the concept denoting the respectability an honourable man accrues with accomplishment (cultural, political, martial), per his station in life. In Book I, the Greek troubles begin with King Agamemnon’s dishonourable, unkingly behaviour — first, by threatening the priest Chryses (1.11), then, by aggravating them in disrespecting Achilles, by confiscating Bryseis from him (1.171). The warrior’s consequent rancour against the dishonourable king ruins the Greek military cause. Accepting prospective death as fair price for avenging Patroclus, he returns to battle, dooming Hector and Troy, thrice chasing him ’round the Trojan walls, before slaying him, then dragging the corpse behind his chariot, back to camp. to go down under the hands of Aiakos’ great son, Achilleus. must go down under the hands of Menoitios’ son Patroclus. Father of the shining bold, dark misted, what is this you said? 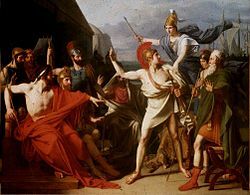 that the generation of Dardanos shall not die. . . .
Divinely-aided, Aeneas escapes the wrath of Achilles and survives the Trojan War. Whether or not the gods can alter fate, they do abide it, despite its countering their human allegiances, thus, the mysterious origin of fate is a power beyond the gods. Fate implies the primeval, tripartite division of the world that Zeus, Poseidon, and Hades effected in deposing their father, Cronus, for its dominion. Zeus took the Air and the Sky, Poseidon the Waters, and Hades the Underworld, the land of the dead — yet, they share dominion of the Earth. Despite the earthly powers of the Olympic gods, only the Three Fates set the destiny of Man. In antiquity, the Greeks applied the Iliad and the Odyssey as the bases of pedagogy; literature central to the educational-cultural function of the itinerant rhapsode, who composed consistent epic poems from memory and improvisation, and disseminated them, via song and chant, in his travels and at the Panathenaic Festival of athletics, music, poetics, and sacrifice, celebrating Athena’s birthday. Originally, Classical scholars treated the Iliad and the Odyssey as written poetry, and Homer as a writer, yet, by the 1920s, Milman Parry (1902–1935) demonstrated otherwise; his investigation of the oral Homeric style — stock epithets and reiteration (words, phrases, stanzas) — established those formulae as oral tradition artefacts easily applied to an hexametric line; a two-word stock epithet (e.g. “resourceful Odysseus”) reiteration complements a character name by filling a half-line, thus, freeing the poet to compose a half-line of original formulaic text to complete his meaning. In Yugoslavia, Parry and his assistant, Albert Lord (1912–1991), studied the oral-formulaic composition of Bosniac oral poetry, yielding the Parry/Lord thesis that established Oral tradition studies, later developed by Eric Havelock, Marshall McLuhan, Walter Ong, et al. In The Singer of Tales (1960), Lord demonstrates likeness between the tragedies of the Greek Patroclus, in the Iliad, and of the Sumerian Enkidu, in the Epic of Gilgamesh, and refutes, with “careful analysis of the repetition of thematic patterns”, that the Patroclus storyline upsets Homer’s established compositional formulae of “wrath, bride-stealing, and rescue”, thus, stock-phrase reiteration does not restrict his originality in fitting story to rhyme. Like-wise, in The Arming Motif, Prof. James Armstrong reports that the poem’s formulae yield richer meaning because the “arming motif” diction — describing Achilles, Agamemnon, Paris, and Patroclus — serves to “heighten the importance of . . . an impressive moment”, thus, reiteration “creates an atmosphere of smoothness”, wherein, Homer distinguishes Patroclus from Achilles, and foreshadows the former’s death with positive and negative turns of phrase. In the Iliad, occasional syntactic inconsistency is an oral tradition effect — for example, Aphrodite is “laughter-loving”, despite being painfully wounded by Diomedes (Book V, 375); and the divine representations, mixing Mycenaean and Greek Dark Age (ca. 1150–800 BC) mythologies, parallel the hereditary basilee nobles (lower social rank rulers) with minor Olympic gods, such as Scamander et al. The Venetus A, created in the 10th century, is the oldest existing manuscript of Homer's Iliad. Classical-era, historical, and contemporary scholars have questioned the true nature of the relationship between Achilles and Patroclus, arguing that the evidence is equivocal for perceiving and defining it as either platonic or homosexual, although Aeschylus does portray them so in Fragment 134a. Necessarily, critics perceive and interpret that manly relationship with their own mores (social, cultural, sexual), thus, fifth-century BC Athenian scholars perceived it as pederastic (then an accepted male relationship), like-wise the others perceived it as either a platonic warrior-bond or as a homosexual pairing of like-age men — despite Homer’s description of Trojan women as war prizes, hence, the sexual-orientation speculation evinced by Achilles’s outrage at King Agamemnon’s confiscation of Bryseis, his war-prize concubine. And don’t lag behind. That will hurt our charge. It should be noted, that Homer does little to actually glorify war. Although depictions are graphic, it can be seen in the very end that victory in war is a far more somber occasion, where all that is lost becomes apparent. On the other hand, the funeral games are a lively entertaining and harmless affair, for the dead man's life is celebrated. This overall depiction of war runs contrary to many other ancient Greek depictions, where war is an aspiration for greater glory. In the literary Trojan War of the Iliad, the Olympic gods, goddesses, and demigods fight and play great roles in human warfare. Unlike practical Greek religious observance, Homer’s portrayals of them suited his narrative purpose, being very different from the polytheistic ideals Greek society used. To wit, the Classical-era historian Herodotus says that Homer, and his contemporary, the poet Hesiod, were the first artists to name and describe their appearance and characters. In Greek Gods, Human Lives: What We Can Learn From Myths, Mary Lefkowitz discusses the relevance of divine action in the Iliad, attempting to answer the question of whether or not divine intervention is a discrete occurrence (for its own sake), or if such godly behaviours are mere human character metaphors. The intellectual interest of Classic-era authors, such as Thucydides and Plato, was limited to their utility as “a way of talking about human life rather than a description or a truth”, because, if the gods remain religious figures, rather than human metaphors, their “existence” — without the foundation of either dogma or a bible of faiths — then allowed Greek culture the intellectual breadth and freedom to conjure gods fitting any religious function they required as a people. Subjects from the Trojan War were a favourite among ancient Greek dramatists. Aeschylus' trilogy, the Oresteia, comprising Agamemnon, The Libation Bearers, and The Eumenides, follows the story of Agamemnon after his return from the war. Simone Weil wrote the essay The Iliad or the Poem of Force in 1939 shortly after the commencement of WWII. Its been claimned the essay describes how the Iliad demonstrates the way force, excercised to the extreme in war, reduces both victim and aggressor to the level of the slave and the unthinking automaton. The 1954 Broadway musical The Golden Apple by librettist John Treville Latouche and composer Jerome Moross was freely adapted from the Iliad and the Odyssey, re-setting the action to America 's Washington state in the years after the Spanish-American War, with events inspired by the Iliad in Act One and events inspired by the Odyssey in Act Two. Christa Wolf's 1983 novel Kassandra is a critical engagement with the Iliad. Wolf's narrator is Cassandra, whose thoughts we hear at the moment just before her murder by Clytemnestra in Sparta. Wolf's narrator presents a feminist's view of the war, and of war in general. Cassandra's story is accompanied by four essays which Wolf delivered as the Frankfurter Poetik-Vorlesungen. The essays present Wolf's concerns as a writer and rewriter of this canonical story and show the genesis of the novel through Wolf's own readings and in a trip she took to Greece. A number of comic series have re-told the legend of the Trojan War. The most inclusive may be Age of Bronze, a comprehensive retelling by writer/artist Eric Shanower that incorporates a broad spectrum of literary traditions and archaeological findings. Started in 1999, it is projected to number seven volumes. Bob Dylan recorded a song entitled "Temporary Like Achilles" for his 1966 album "Blonde On Blonde". Led Zeppelin recorded a song entitled "Achilles Last Stand" for their 1976 album Presence. Power metal band Blind Guardian composed a 14 minute song about the Iliad, "And Then There Was Silence", appearing on the 2002 album A Night at the Opera. Heavy metal band Manowar composed a 28 minute medley, "Achilles, Agony and Ecstasy in Eight Parts", in their 1992 album, The Triumph of Steel. Other heavy metal bands inspired by the epos: Manilla Road "The Fall Of Iliam"; Stormwind "War Of Try"; Virgin Steele composed a rock opera in two parts called The Fall Of House Atreus; Jag Panzer "Achilles"; Arcane "Agamemnon"; Warlord "Achilles Revenge"; Tierra Santa "El Caballo De Troya". An epic science fiction adaptation/tribute by acclaimed author Dan Simmons titled Ilium was released in 2003. The novel received a Locus Award for best science fiction novel of 2003. A loose film adaptation of the Iliad, Troy, was released in 2004, starring Brad Pitt as Achilles, Orlando Bloom as Paris, Eric Bana as Hector, Sean Bean as Odysseus and Brian Cox as Agamemnon. It was directed by German-born Wolfgang Petersen. The movie only loosely resembles the Homeric version, with the supernatural elements of the story were deliberately expunged, except for one scene that includes Achilles' sea nymph mother, Thetis (although her supernatural nature is never specifically stated, and she is aged as though human). Though the film received mixed reviews, it was a commercial success, particularly in international sales. It grossed $133 million in the United States and $497 million worldwide, placing it in the 64th top-grossing movie of all time. S.M. Stirling's Island in the Sea of Time series contains numerous characters who are clearly the "original versions" of those appearing in the Iliad. Odysseus himself plays a major role in the third and last book, On the Oceans of Eternity. The twentieth-century characters are quite aware of this and make rather frequent reference to it. One, for example, comments that "a big horse ought to be present at the fall of Troy", and another uses the glory that the poem would have brought its protagonists to turn one of them against his master. Alesana's "The Third Temptation of Paris" is based on the theft of Helen and the subsequent consequences. George Chapman published his translation of the Iliad, in instalments, beginning in 1598, published in “fourteeners”, a long-line ballad metre that “has room for all of Homer’s figures of speech and plenty of new ones, as well as explanations in parentheses. At its best, as in Achilles’ rejection of the embassy in Iliad Nine; it has great rhetorical power”. It quickly established itself as a classic in English poetry. In the preface to his own translation, Pope praises “the daring fiery spirit” of Chapman’s rendering, which is “something like what one might imagine Homer, himself, would have writ before he arrived at years of discretion”. John Keats praised Chapman in the sonnet On First Looking into Chapman's Homer (1816). John Ogilby’s mid-seventeenth-century translation is among the early annotated editions; Alexander Pope’s 1715 translation, in heroic couplet, is “The classic translation that was built on all the preceding versions”, and, like Chapman’s, it is a major poetic work, in its own right. William Cowper’s Miltonic, blank verse 1791 edition is highly regarded for its greater fidelity to the Greek than either the Chapman or the Pope versions: “I have omitted nothing; I have invented nothing”, Cowper says in prefacing his translation. After a discussion of the metres employed by previous translators, Arnold argues for a poetical dialect hexameter translation of the Iliad, like the original. “Labourious as this meter was, there were at least half a dozen attempts to translate the entire Iliad or Odyssey in hexameters; the last in 1945. Perhaps the most fluent of them was by J. Henry Dart  in response to Arnold”. In 1870, the US poet William Cullen Bryant published a blank verse version, that Van Wyck Brooks describes as “simple, faithful”. Moreover, since 1950, there have been several English translations. Richmond Lattimore’s version is “a free six-beat” line-for-line rendering that explicitly eschews “poetical dialect” for “the plain English of today”; it is literal, unlike older verse renderings. Robert Fitzgerald’s version strives to situate the Iliad in the musical forms of English poetry; his forceful version is freer, with shorter lines that increase the sense of swiftness and energy. In comparison, Lattimore’s rendering might seem dull and plodding, where Fitzgerald’s “voice . . . [is] sometimes a better reflection of the nuances and connotations in the original Greek than [is] Lattimore’s” voice. Robert Fagles and Stanley Lombardo are bolder in adding dramatic significance to Homer’s conventional and formulaic language; generally, Fagles’s fidelity to the original is greater, while Lombardo employs a distinctly American, colloquial, “steet verse” idiom that has been criticised as out-of-tune with Homer’s original diction. Rodney Merrill’s accentual, dactylic hexameter more accurately reproduces the poem’s original Greek sound and sense “by following the Homeric line, in its shape as well as its meter” with greater fidelity than previous translations. Samuel Butler, 1898 — prose: full text (many typographic errors, confusing to read). Homer. The Iliad, Richmond Lattimore, translator. Chicago: University of Chicago Press (1951). 1.13. Homer. The Iliad, Richmond Lattimore, translator. Chicago: University of Chicago Press (1951). 1.122. Homer. The Iliad. Richmond Lattimore, translator. Chicago: University of Chicago Press (1951). 1.181–7. Homer. The Iliad. Richmond Lattimore, translator. Chicago: University of Chicago Press (1951). 18.111–16. Homer. The Iliad. Richmond Lattimore, translator. Chicago: University of Chicago Press (1951). 16.849–54. Homer. The Iliad. Richmond Lattimore, translator. Chicago: University of Chicago Press (1951). 16.433–4. Homer. The Iliad. Richmond Lattimore, translator. Chicago: University of Chicago Press (1951). 16.440–3. Homer. The Iliad. Richmond Lattimore, translator. Chicago: University of Chicago Press (1951). 22.178–81. Homer. The Iliad. Richmond Lattimore, translator. Chicago: University of Chicago Press (1951). 20.300–4. Porter, John. The Iliad as Oral Formulaic Poetry (8 May 2006) University of Saskatchewan; accessed 26 November 2007. Armstrong, James I. The Arming Motif in the Iliad. The American Journal of Philology, Vol. 79, No. 4. (1958), pp.337–54. Toohey, Peter. Reading Epic: An Introduction to the Ancient Narrative. New Fetter Lane, London: Routledge, (1992). Robot Scans Ancient Manuscript in 3-D, Wired. Homer’s Iliad, Classical Technology Center. Taplin, Oliver. “Bring Back the Gods”, The New York Times 14 December 2003.